Often when speaking with customers, there is a large discussion about what reverse proxy is used for Skype for Business deployments, cost of them and network dependencies. Experience has taught me that reverse proxies often take up far too much time on the discussion table because customers usually do not understand their need. They view these as nothing more than pass-thru devices and fail to understand or “buy in to” the edge network protection they provide when deployed properly. 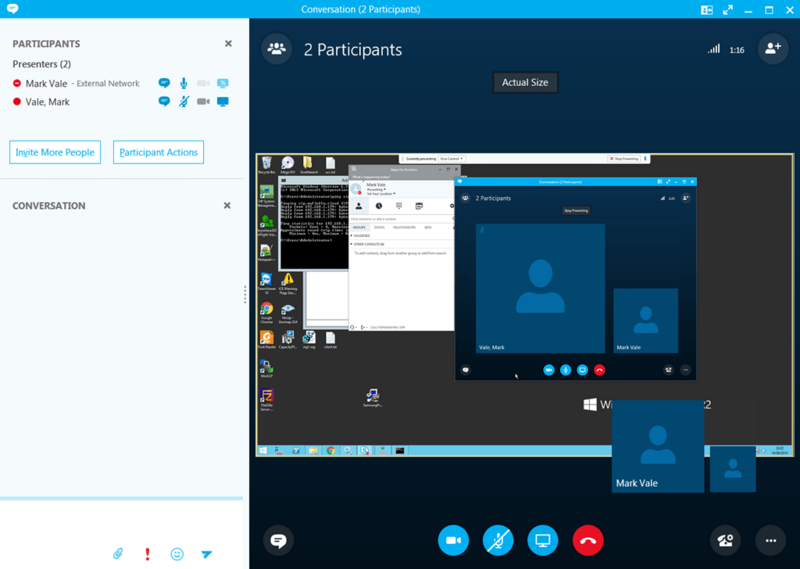 But Skype for Business requires one, so in the end its a choice, external meetings and mobility, or not? Customers then ask for the cheapest solution and until now we are limited to WAP and KEMP as official qualified devices. Both have disadvantages. WAP has a dependency on ADFS which is a big turn off to customers who do not have a requirement for ADFS beyond simple reverse proxy. KEMP can be quite an expensive solution depending on throughput and high availability requirements. So I have been looking for an alternative, cheaper, easier solution and as a result have been playing around with Azure AD Application Proxy. I admit this is not a qualified solution, but neither is Netscaler, IIS ARR and TMG, but we still use them… I would always advise to use qualified solutions for full end to end support. 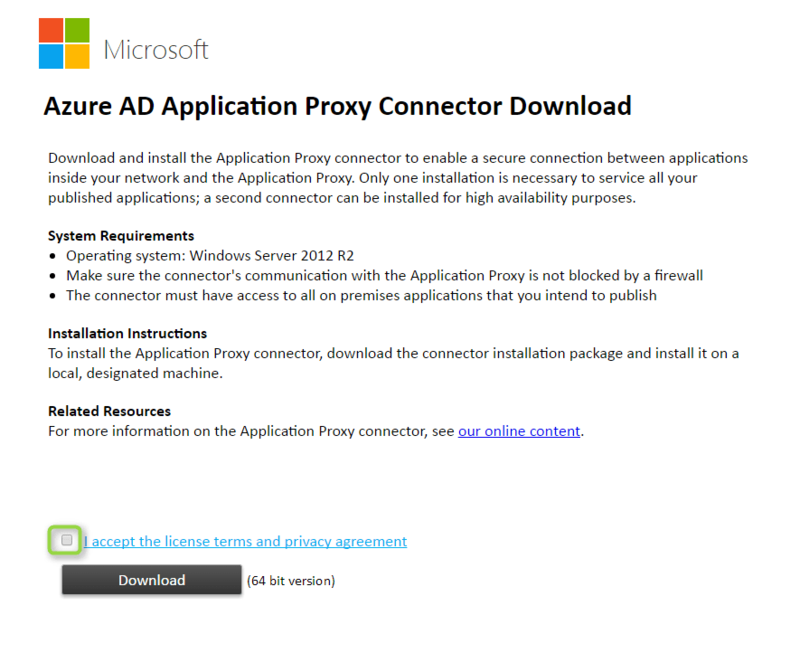 That said, I wanted to find out if Azure AD Application Proxy “works”. 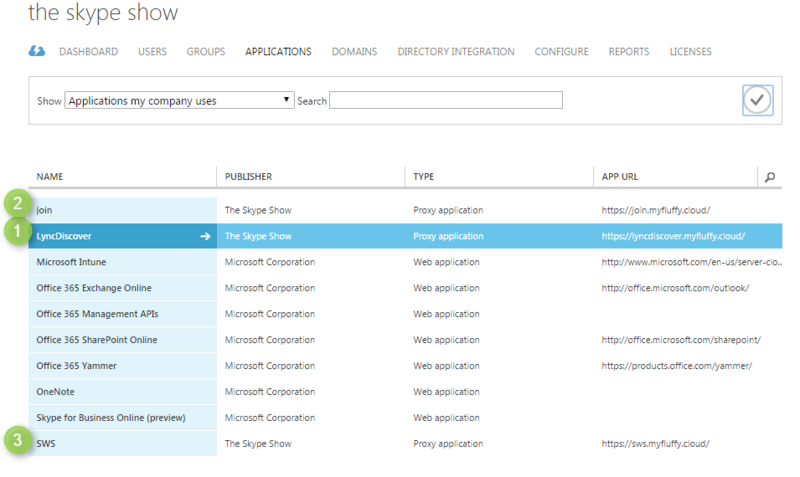 What is Azure AD Application Proxy? It is a service available in Azure AD Premium that allows us to publish internal web applications to the internet securely without having to provision external access to a particular server using NAT, Firewall rules and our own hardware. This got my attention for a few reasons. 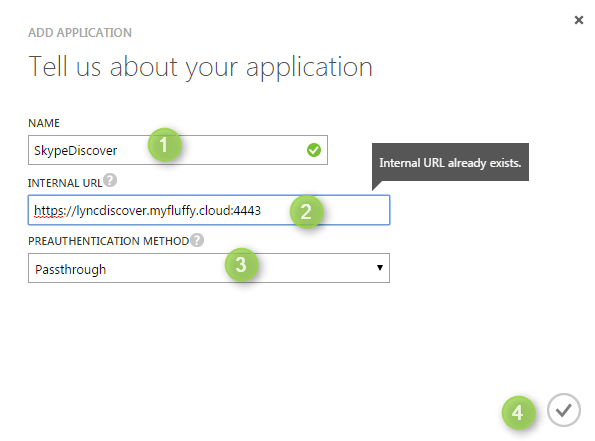 In order to use Azure AD Application Proxy, you need one user licenced for Azure AD Premium. Application Proxy is available on the free or basic version of Azure AD, but the type of proxy we need for this solution is only available in the Premium version. The cost of Azure AD Premium is about £5.50 per user per month, and we only need one licence. Therefore, at £60 per year this makes this the cheapest reverse proxy solution you can buy. 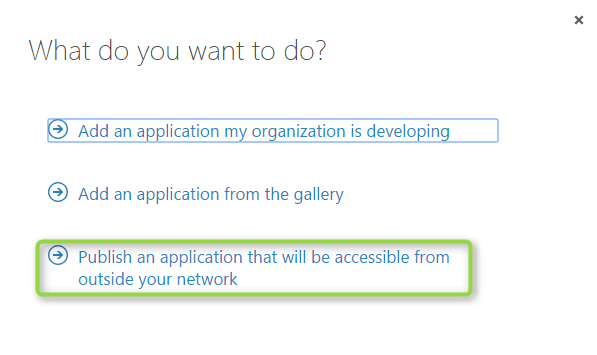 As I mentioned before, the Azure AD Application Proxy requires no on-premises networking configuration or hardware. 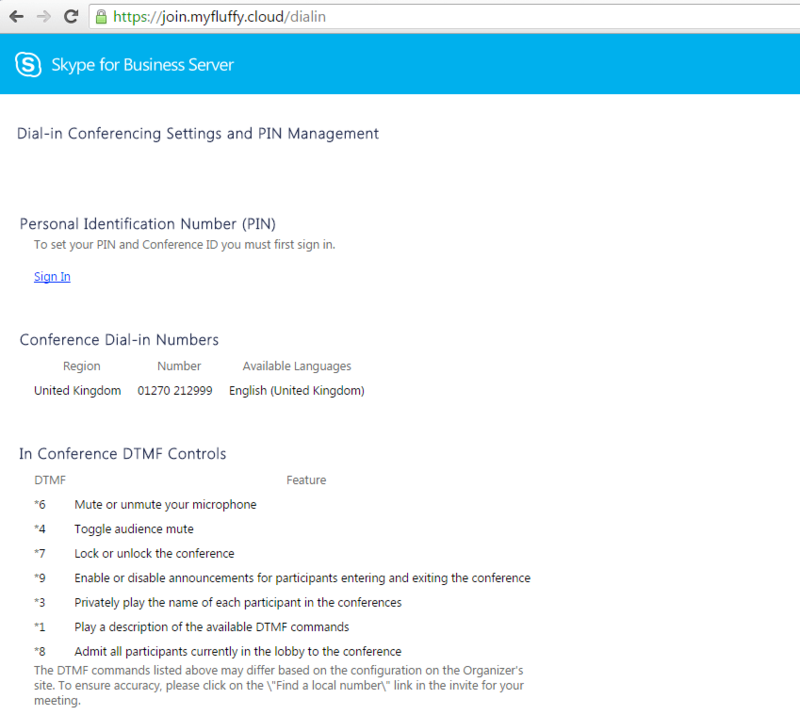 However, it does require port 443 outbound to the internet from the Skype for Business Front End Servers. There is an Azure AD Application Gateway, or connector to install on the front end servers. 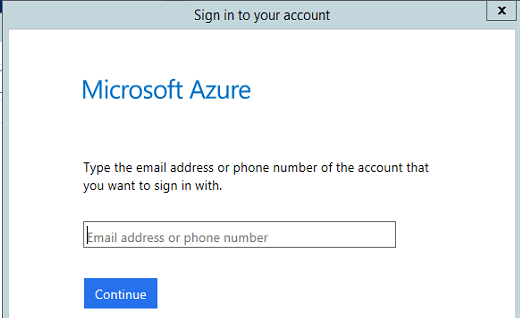 This is a light weight installation that requires the Azure AD Premium licenced and Global Administrator credentials to login and connect to the Azure AD service. As this is an outbound only connection, the application uses Azure Service BUS messaging system to keep the outbound connection open to avoid connection sleeping. You also need to ensure you have your UCC SAN certificate exported with the private key to a password protected PFX file to upload to Azure AD in the same manner as if you would for an on-premises server. As this service is connector driven, we cannot use on-premises hardware load balancer VIP as the connection source point from the on-premises systems to the Azure AD Application Proxy. 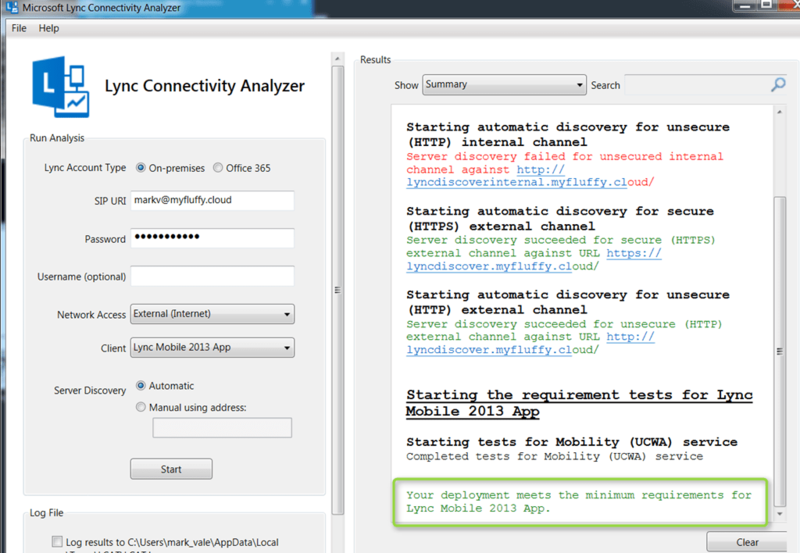 The application connector must be installed on each front end server and rely on the Azure AD Application Proxy health indicator and round robin effect for HA to your on-premises front end pool. You could spin up an IIS ARR or WAP server in a DMZ and configure that as a reverse proxy to install the connector on. However, the benefit of Azure AD Application Proxy reduces to protecting your network from DDoS attacks etc that could hit your perimeter edge firewall and bring down multiple services. For some, this may be a selling point, but I would imagine for many, this would be an over engineered solution that adds unneccessary complication. For the rest of this blog, I will assume that the connector will be deployed to a front end server. Firstly, you must have an Azure AD Premium licence. If you do not have one, then you can apply for a free trial via the subscriptions shopping cart within Office 365. Once acquired, assign this to your global administrator user. Once assigned, you must sign out of Office 365 and sign back in for the licence to take effect. Please also note that it can take 15 minutes or more for your Azure AD to be upgraded to Premium. 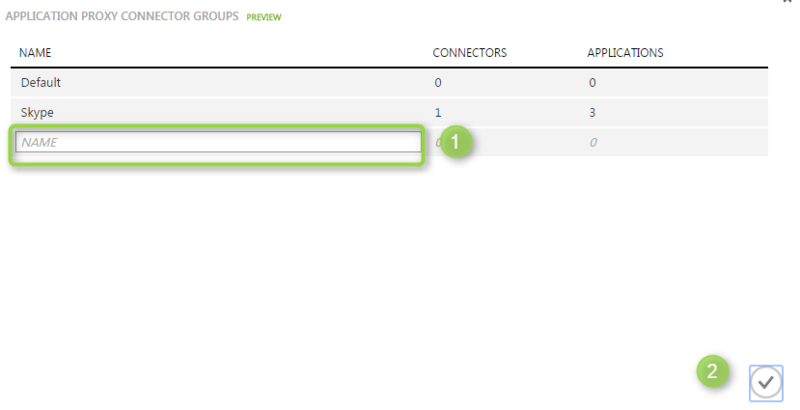 Next, assign the application to the connector group we made earlier. This will tell the Azure AD Application Proxy which back end server to send the request to. On the Translate URL headers option make sure that you tick NO. We want the application proxy to send the original headers to the front end servers in tact. Now Azure AD Application Proxy is configured, we now need to download and install the connector to the front end server. From the application dashboard from one of the application rules you have created e.g. lyncdiscover click download connector (note: this button will be green if a connector has not been downloaded before). Launch the application installer on the front end server (you only need one connector installed, this will do all lyncdiscover, simple urls and web service applications). The setup will now complete. 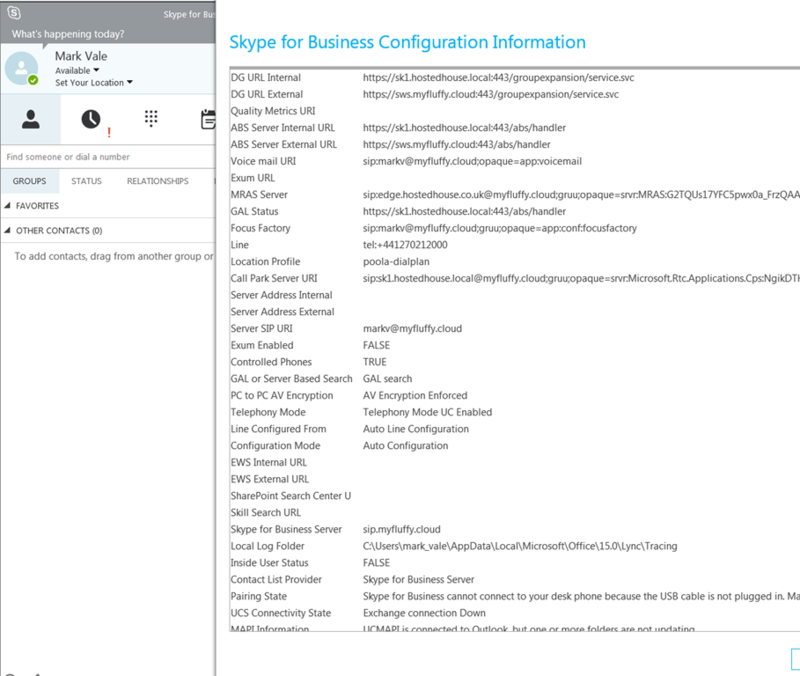 This now completes the setup of the Azure Application Proxy service as a reverse proxy for Skype for Business. 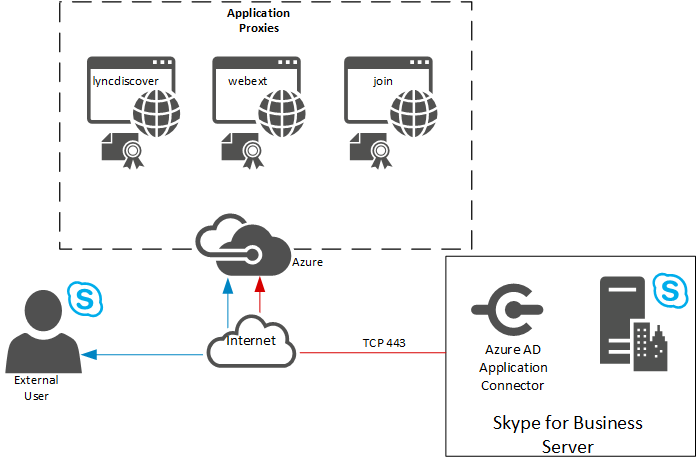 As I have demonstrated here, it is possible to use Azure AD Application Proxy as a reverse proxy solution for Skype for Business server. The first thing you may be thinking is this is not supported, and you are right! The reason why I chose to post this blog and guide is purely an experiment and in a proper deployment all efforts should be made to use a qualified solution. However, there are many customers that chose to ignore advice, or seek their own workarounds due to budget or technical limitations of their network at the time, so in some circumstances this may be an option for them to consider if supportability is a low priority. Evaluating this in a lab environment will always give less than real world results, and I have to say that initial testing in my lab with limited resources initial connection establishment is about 1 to 2 seconds slower than having your own on-premises reverse proxy solution (benchmarked against a KEMP VLM). However, once the connector is fully operational there is no performance loss against an on premises solution that is noticable anyway. The backend Azure service egress point for my testing in Azure even though my tenant is located in North Europe in Ireland, it looks at though the Azure AD Application Proxy endpoint for me is actually located in West Europe (Holland) according to the public IP assigned to the Azure Service. This may introduce some latency (negligable) over https traffic (not voice!). I can see this solution working for Standard Edition deployments more than enterprise edition if I am honest. The deployment process is suited to a single server solution rather than multiple, load balanced solutions. 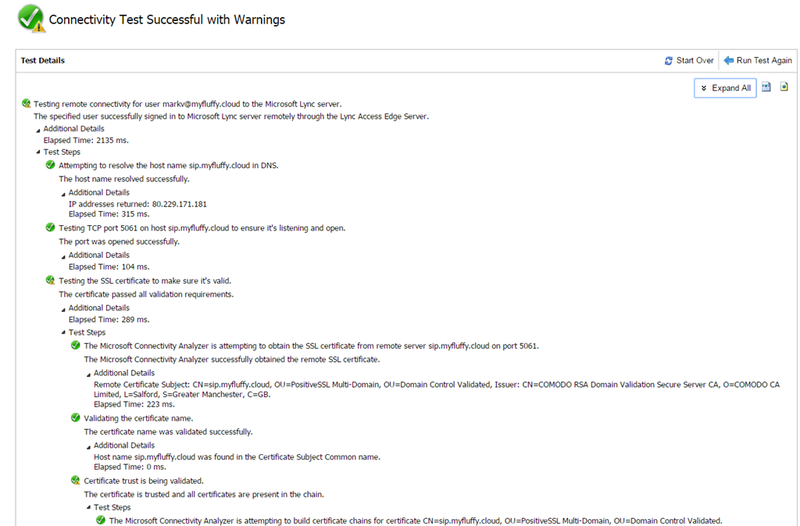 I have not test enterprise edition against this and have some unknowns on how Azure AD Application Proxy handles load balancing multiple connectors. Failover scenarios is much the same as a normal reverse proxy solution, but is actually quicker using this method than the traditional on-premises solution. In a failure scenario you would just assign the standby front end pool connector to the production live connector group and deallocate the failed front end server connector to a standby (unused group) and the change over will be instantanious rather than messing around with DNS records and reverse proxy rules etc. This solution cannot be used for your Edge servers, so this does not negate the need for them or a DMZ network, this service is purely a http proxy solution. For the money it costs to use this service it is an absolute bargain and would be very attractive to SMB. Would I deploy it to a customer site? At the moment not for production due to lack of support but for a small scale proof of concept then this is a great little way of improving rapid deployment timescales. It will be interesting for sure to watch this product develop to see if Microsoft actually bring this solution under support for Skype for Business. For now the solution “works”, but I am hesitant to say it “works properly” at this moment. Is there a way we can to that (extend timeout time) on the Azure AD Application Proxy. At the moment no there is no way to set the timeout as yet. The Azure AD App Proxy is as I stated in this article still early days and an experiment rather than for production use at this point. perhaps reverting your production deployment to a more standard approach is best and leave the cutting edge technology to mature a little. We have an issue to share PPT files through AD Azure application proxy. When we upload PPT file the screen stuck on “loading” status. We have installed the connector on the OWAS and the XMl URL is available from outside. Is there any speical configuration for publishing OWAS through AD Azure application proxy?